Over 1,600 miles long, the Moroccan Wall, or Moroccan Berm, is the longest operational military barrier in the world, and you have probably never heard of it. The wall is made of rock and sand, fortified with trenches, barbed wire, and an estimated seven million landmines. The Guardian estimates 120,000 soldiers- for comparison’s sake, there were 166,000 soldiers in Iraq at the peak of the Iraq War - patrol the wall. The Berm, which divides Western Sahara, is 12 times longer than the Berlin Wall. Roughly the size of Britain, Western Sahara runs along Africa’s Atlantic Coast. The current conflict is rooted in careless line drawing in the post colonial era. Spain colonized Western Sahara at the turn of the century, conquering the Sahrawi people indigenous to West Sahara. After the United Nations called for the decolonization of the Western Sahara in 1965, the Saharawi formed an independence movement- the Polisaro Front- to oust the Spanish occupiers. With the threat of war and the death of General Franco, Spain relinquished its holding. In 1976, the Spanish colonizers divided Western Sahara between Morocco and Mauritania, a neighboring country. The Polisaro Front then launched a 16-year long war for independence against Morocco and Mauritania. Armed warfare ensued until 1991 when the United Nations brokered a ceasefire. Under the terms of the ceasefire, Morocco was to conduct a referendum in which the Sahrawi people living in Western Sahara would vote whether they wanted to become an independent nation or remain under Moroccan sovereignty. As of the writing of this article, the referendum has not been conducted, leading many scholars to label the Western Sahara as the last colony in Africa. 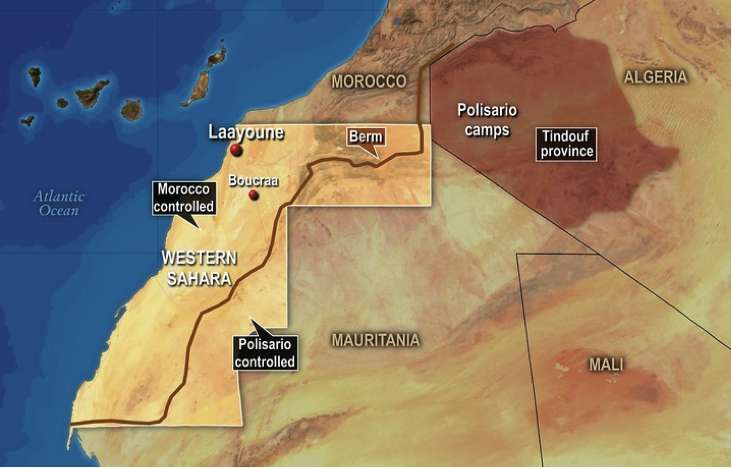 With the referendum in limbo, Morocco has extracted mineral and fishing resources from Western Sahara in direct contravention of international law. Stretching through the length of the disputed Western Sahara territory, the wall separates the Moroccan–controlled Southern Provinces from the Polisario–controlled Free Zone. In doing so, the wall is the physical embodiment of the conflict that has plagued the region since the 1970’s. The conflict between Morocco and Western Sahara has driven approximately 158,000 Sahrawis to refugee camps in Algeria, and these refugees are determined to stay in Algeria until Western Sahara is declared an independent country for the Sahrawi, even if many, especially young Sahrawi children, are growing increasingly impatient waiting for the referendum. The geopolitics of the wider North African region have shifted dramatically. Libya is a fount of instability. Mali, several nations away, has become a focus of anti-al Qaeda operations. Currently, the Polisario movement’s most notable ties are to Algiera and international socialists. Should international leaders wish to insure that this growing unrest does not lead to the spread of terrorist ideologies among these restless youth perhaps the time has come for the US and the international community to step into this unresolved situation more carefully. Before it is too late.